Fig. 1. 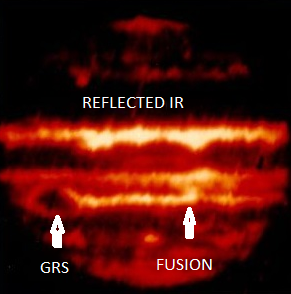 Surface fusion reaction flowing to GRS is producing Jupiter’s internal heat. A recent (41 page) paper published in Nature Communications, titled “Less absorbed solar energy and more internal heat for Jupiter” by Liming Li et al. goes to great effort to determine accurately the energy budget of Jupiter. A more accurate value is hoped to determine the source of Jupiter’s internal heat – a problem never solved due to the assumption it is a gas giant comprising 90% H2 and 10% helium. Simply put, Jupiter’s internal heat radiation is significantly greater than that being absorbed from the Sun. Fig. 2. Helion vortex produces Jupiter’s constant auroral ovals with power of 5 Terawatts. As accurate as the methods appear, they are based completely on Cassini measurements from the ecliptic plane, i.e. no views of the polar areas are included. I note this because studies of the auroral ovals by Juno JIRAM have measured constant UV radiation at the level of 5 Terrawatts from each pole, where a Tw = 1012 watts (Figure 2). ‘Gas giant’ advocates will respond by publishing numerous papers, tinkering with their models of Jupiter’s interior, called the equation of state of a hydrogen/helium mixture, which has never been successfully determined. This has never been a high priority issue, because every scientist in the world is sure that Jupiter is a gas giant, as suggested by Rupert Wildt in 1930. That’s progress! As posited in many articles on this site, (e.g. enter “Jupiter” in the Search window), Jupiter (also Saturn) is a solid, low density, highly deuterated Methane Gas Hydrate (MGH) body which, since it is a clathrate, physically encapsulates all the elements in their known solar system abundances. The clathrate structure is (CH4)4(H2O)23. The highly deuterated state of Jupiter means that a lot of the H is actually D. Note that Jupiter is 80% water. Shoemaker-Levy 9 fragments also produced fusion bomb explosions when they hit the surfaces, the ‘main events’ of which were delayed 6 minutes because it took that long for the mushroom clouds to reach the cloud-tops (Figure 3). The last big impact explosion occurred 6,000 years BP and produced proto-Venus. A continuous fusion burning created on Jupiter’s surface by that impact (Figure 1) has slowly declined over the last 6,000 years but is still producing Jupiter’s unexplained high internal heat, multiple wind bands and magnetic field. 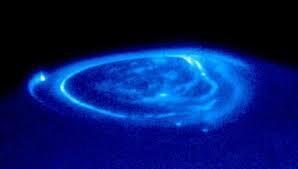 The fusion products are 1032 helions (3He++)/sec, each with an energy of 4.98 MeV, they are invisible but form the vortex seen as the Great Red Spot due to Coriolis effect, through which all the heavy elements being released from the MGH flow out into the upper atmosphere, forming the colored clouds which NASA scientists have not yet identified. That is why both Venus and Jupiter are hot. The energy from that impact currently being reflected back from space is what the Nobel geniuses tell us is radiation from the creation of the universe. But God hath chosen the foolish things of the world to confound the wise; and God hath chosen the weak things of the world to confound the things which are mighty; And base things of the world, and things which are despised, hath God chosen, yea, and things which are not, to bring to nought things that are:That no flesh should glory in his presence. ~ by Angiras on October 30, 2018.